Like other motorcycle producers, Piaggio spent part of its research to the military use of vehicles. The first projects presented to the Ministry of Defence in Italy date back to the beginning of the fifties, of which there is written evidence such as drawings (like the image that compares the Vespa 125 with a motorcycle). 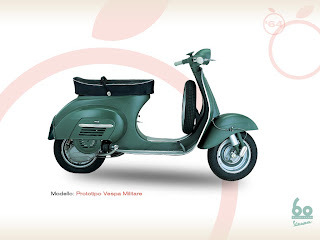 The 1964 model derives from the Vespa 125 (VMA1) with a few changes on the frame to reduce encumbrance. In fact, the handlebar and the front wheel can be quickly removed and placed on the left-side sack. After negotiations with the Italian Ministry of Defence, the Vespa military has remained as a prototype.